South Korea's automobile exports shot up 22.6 percent on-year in December on the back of the release of new models from local carmakers, government data showed Friday. 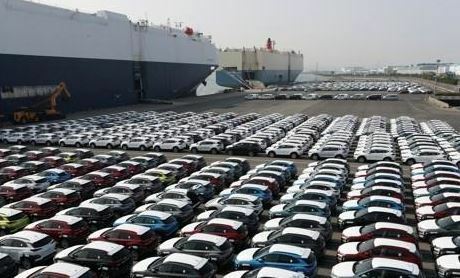 According to the Ministry of Trade, Industry and Energy, automakers here shipped 219,313 cars overseas last month, rising sharply from a year earlier, with the value estimated at $3.78 billion. For the whole of 2018, the number of cars shipped abroad edged down 3.2 percent to 2.44 million units, or $40.9 billion due to the falling demand from emerging markets in the Middle East and Central and South America. The combined exports declined for the third consecutive year. The demand from Russia, European and African countries, however, continued to gain ground on an annual basis following the economic recovery in the regions, the industry ministry said. The number of cars produced in the country last month shot up 24.2 percent in the one-month period to 356,940 units, with the gains being led by SUVs. For all of 2018, the figure dropped 2.1 percent on-year to reach 4.02 million units after GM Korea, South Korea's third-largest manufacturer, closed its plant in the southwestern city of Gunsan. For the last month of 2018, domestic car sales, including imports, moved up 4.1 percent to reach 159,864 units as companies engaged in aggressive marketing programs, the ministry said. The total number of cars sold in the country last year was tallied at 1.81 million units, also up 1.1 percent on-year, led by the popularity of imported vehicles. The ministry said there was high demand for SUVs, but the sales of domestic cars actually edged down 0.7 percent to 1.53 million units as the demand for other types of vehicles lost ground. While the safety scandal of BMW cars emerged as a hurdle for foreign carmakers, the resumed operations of Volkswagen and Audi led to an increase of 12 percent on-year in 2018. Imported vehicle sales reached 281,000 units.